You can lauch from a dock in Telegraph Cove. Here you can also rent canoes, kayaks and anything else you may require for your trip. Launch from Telegraph Cove on the east coast of Vancouver Island. Follow the coast until you reach signs for Robson Bight. It is forbidden to enter the Bight, but there are plenty of campspots on beaches along the way, the most popular being Kaikash Beach. Paddle as far as you want, then turn around and paddle back. Marine charts are available at Telegraph Cove. This is a sheltered ocean paddle that takes you into Killer Whale (Orca) territory. 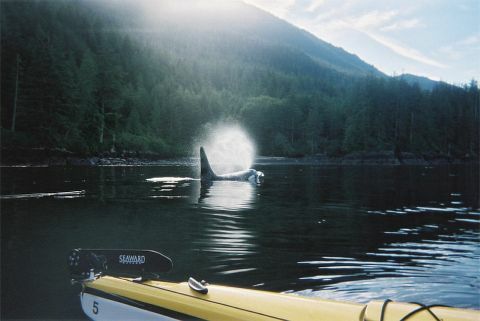 It is very likely you will have very close encounters with Orcas. Be sure to tap on your boat as they approach so they know where you are. This area is also a major shipping route with everything from commercial fishing boats to cruise ships. Care must be taken when crossing Johnstone Strait. It is advisable to carry a marine radio as storms can blow up fast and stay long. I believe this information to be far too vague for first time visitors to Robson Bite. I've paddled extensively in this area and new visitors should take every precaution for high winds and strong currents. Please ask for more information on the CCR web forums before planning this trip. We are planing a holiday in Vancouver next summer with my family and friends. I'm willing to try this route and see the orcas. Can the boys of 10 years come with us?? You can also launch from South of Robson Bight. It combines some river section as well as marine. A Vancouver Island Backroad mapbook will show where the access road leaves the highway. Look for Adam and Eve rivers and put in at the Forestry Rec Site. When you arrive back at the rivers mouth you will need to hike back up the road to reach the campground and car.